DATELINE: Cape Canaveral, 2043 – Faster-than-light Travel Possible! Critical Path is a game of intense, interpersonal drama and shifting perspectives set aboard the Victoria II, a prototype starship on its maiden voyage. Join the crew as they race to the edge of possibility, pushing the boundaries of knowledge – of themselves and the universe around them. Note: This game contains mature, angst-ridden, trigger-filled themes. In fact, it’s kind of all about them. If you are concerned about this, please do not play. It is not for children under 18 and should not be taken lightly. It is low-mechanics / high drama. Don’t try to solve the problem, just strap in and enjoy the ride (but don’t say we didn’t warn you). Because she is kind and gracious and good, Kathleen invited me to her run of Critical Path. I hadn’t heard about the larp before but the questionnaire made it pretty clear what we were in for. This was one of my favorite questions, I think it hit the nail on the head. 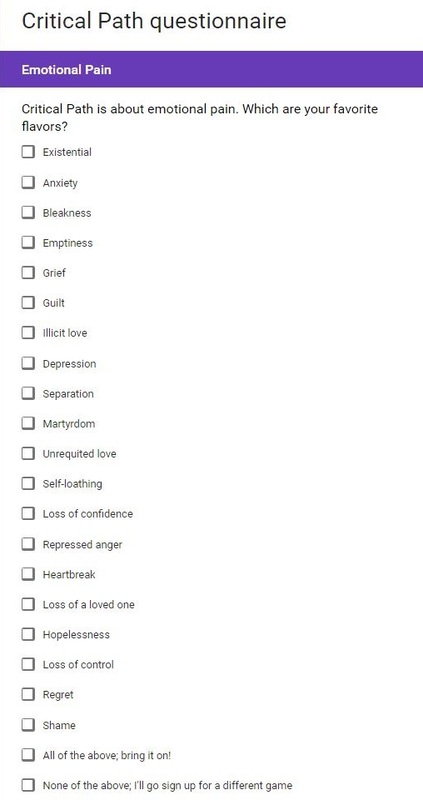 I think I started clicking away and then just checked All of the above because it was easier! Like Storm Cellar (also a larp developed at Peaky Midwest), Critical Path had a bit of reading to do before the game. A few pages about the setting and situation (what everyone knows) and then a few more about your character, and the tangled web they’ve woven so far. Karen (who played Alex Sheppard, the documentarian) and I (Jamie Williams, the government liaison) didn’t really know how to dress up for the larp, but we thought that contemporary professional attire would do. Karen wearing a sweater and scarf, me in a shirt and tie. Minor effects in the grand scheme of costumes, but they worked well…I got to adjust my tie for effect several times! The game started late due to some last minute cancellations, so while we waited Kathleen gave us the lowdown on the larp format, which I really appreciated. *SPOILER ALERT* Things that I don’t think should be spoilers, but some might, to follow. Critical Path deals with alternate realities. Every time you jump into hyperwave (you’ll jump nine times during the game) you enter an alternate reality where something about your past (usually a decision you or someone else in the game made) was different, and you experience a different reality because of it. None of the other jumps, nor the “base” reality is remembered when you’re in the wave. When you come out of hyperwave the alternate reality is remembered as though it was a very lucid dream. And this effect is cumulative. Each time you enter, you start a fresh, but each time you get out, you remember all the alternate realities you’ve experienced. The net effect is a dizzying emotional roller coaster because you get to experience a ton of “what if” scenarios. Some which work out well for you and some which are very, very bad. I’m mentioning that Kathleen told us about this in advance here because I think it was SUCH a brilliant move to do. Instead of causing tons of confusion in game that would have invariably required GM consultation/clarification, we walked into the game knowing what kind of general experience to expect, and when we got them (in the form of half page instructions about how our new reality is different) we were ready to jump into the new roles immediately rather than feeling sideswiped by them. My take away from this is TALK TO YOUR PLAYERS, and trust in them as well. We’re in it to have fun, but we’ll have a lot more fun if we know the rules of the game before we start playing. I’m probably belaboring this now, but thank you so much for this Kathleen, it was absolutely the right call. The game takes place (mostly) on the Victoria II, a space shuttle that will make the first hyperwave jump with sentient life on board. To create the Victoria Kathleen and Brian moved around their room to add custom lighting (which allowed the GM to color code when we were in and out of hyperwave), speakers for an intermittent sound track, assigned seating (which had each of her alternate reality sheets beneath them), and a number of other props that were used throughout the game. Super cool stuff. The other thing that was present on the Victoria II was a camera (Brian’s Ipad) that Alex Sheppard used to document the entire trip. Which was a trip itself! At the risk of starting to give away actual spoilers, I’ll stop with plot exposition and just say, this game was gut wrenching and sad in all the best ways. All the work Kathleen, Sophie, and Brian did to set up the game really paid off. Because it was so well orchestrated we hardly had to call on Kathleen as GM at all during the game, and she was able to watch and listen in while we followed our many and varied fates. So well done! Hakan, Kara, and I had a very complicated relationship, which changed several times throughout the game. Thank you both so much for going on that journey with me! In one of the realities I played a really tyrannical version of myself. It was an uncomfortable role to fill and I’m glad I only had to do it for a few minutes, but I felt like I brought it home, which I was really nervous about as I read the write up for that reality. Everyone in the game did a stellar job of separating out what we were supposed to know at any given time. Because of that we got to “re-meet” each other several times. It was great seeing a character and then moments later seeing them again in a very different light, just because one decision had been different years ago. This game has a lot of moving parts, but for all runs extremely smoothly with minimal GM interaction require, no conflict resolution mechanism needed, and a lot of player driven development. It promised a lot of emotional content and it delivered! I was still exhausted from steaming earlier in the day and with the game starting late, I was fading toward the end of the game. I don’t think it hurt the game much, but I remember sitting down and trying to read my new reality and the words just looking blurry. I think I was the one holding us up from going to hyperwave a few times while I finished reading my update!